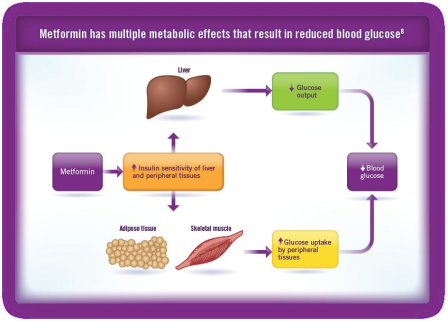 Metformin’s low risk of side-effects has lead to studies testing its therapeutic potential and effectiveness in treating other conditions. These include the prevention of cancer (Riedmaier et al., 2013). High plasma insulin levels are typical for T2D patients. However insulin has now been linked to cell growth and proliferation and hence plays an important role in neoplasia and the occurrence of cancer (Pollak, 2008). It is believed to encourage tumour growth as a high number of insulin receptors can be found on neoplasias (Johnson, 2010). AMPK is indirectly activated by metformin, which reduces the plasma glucose and insulin levels as glucose gets taken up by muscles. Thus the drug acts in an indirect way reducing the effects that elevated insulin levels have on tumour growth (Riedmaier et al., 2013). Figure 1 on the left shows metformin’s action and the subsequent decrease in blood glucose level and insulin concentration (Komboglyze, 2012). Several trials have examined metformin’s potential in preventing cancer, testing its anti-neoplastic and anti-proliferative effects. A study by Goodwin investigated if metformin lowers insulin levels in obese women, who are associated with a poor breast cancer outcome. The findings of this study showed that insulin levels decreased significantly but a phase III randomised trial is needed to investigate metformin’s effect on breast cancer further (Goodwin, et al., 2008). Several trials have found positive effects of metformin on patients with breast cancer and recommend further trials to investigate metformin’s potential anti-neoplastic effect (Jiralerspong, et al., 2009). A study by Hosono showed metformin’s anti-proliferative effects. It investigated the effect of metformin on rectal aberrant crypt foci, which are a marker of colorectal cancer and found a significant reduction in the proliferation of the colonic epithelium (Hosono, et al., 2010). Different trials have been performed extending from the diabetic and obese patient target-group, which proved that metformin has a significant effect on different types of cancer by lowering plasma insulin (NCI, 2013); however further trials to support these findings are still under way and need to transition into phase II and III, reinforcing metformin’s substantial potential of cancer prevention and treatment as it has been seen to improve the prognosis of existing cancers (Duncan, 2009). An alternative pleiotropic mechanism of metformin brings me to the next key point in this article (Saftig, 2012). AMPK is naturally active in nutrient poor conditions (Gwinn, et al., 2008). It is activated by LKB1, a protein threonine kinase encoded by a tumour suppressor gene (Shaw, et al., 2005). Activated AMPK causes a decrease in mTOR signalling, which is responsible for cell growth, proliferation and metabolism, and the inhibition of protein synthesis in cancer cells (Laplante, 2009) (Riedmaier, et al., 2013). As an anti-neoplastic drug metformin has the potential to activate AMPK, followed by the inhibition of mTOR signalling, which would result in a decrease in protein synthesis and cell proliferation of cancerous cells and hence cancer could be prevented. Furthermore it has been shown that AMPK can phosphorylate p53, which can cause the cell cycle to come to a stop and can trigger apoptosis in certain cells. This has huge implications showing the powerful potential of metformin as an anti-neoplastic drug, in that it can prevent mTOR from expressing its effects and causing cancer cell growth and proliferation (Martin, 2012). The activation of p53 further shows that metformin could help in the treatment of cancer as it could cause cancerous cells to undergo apoptosis. Further research has shown that metformin targets REDD1, which is a negative regulator of mTOR, and increases its expression, which leads to the inhibition of mTOR and its effects. Furthermore REDD1 was demonstrated to be dependent on p53 and helps to arrest the cell cycle, which was seen when REDD1 was inhibited (Sahra, et al., 2013). Figure 2 summarises the role of AMPK, visualising how activated p53 causes the cell cycle arrest and the mTOR signalling pathway is inhibited, stopping cell growth and protein synthesis. One AMPK independent effect metformin has, is that it stops the production of tumour necrosis factor and tissue factor in human monocytes through the inhibition of early growth response factor-1 and the phosphorylation of extracellular signal-regulated protein kinase 1/2 (Arai, et al., 2010). This causes a reduction in the chronic inflammatory response (CIR). Certain cancer types’ progressions are based on chronic inflammation so by reducing the CIR metformin helps prevent tumour progression and development (Riedmaier, et al., 2013). Another AMPK independent effect metformin shows is that it can cause cell cycle arrest. By significantly decreasing the expression of cyclin D1 and retinoblastoma-protein, a decrease in cyclin-dependant kinase signalling pathway was achieved, which eventually lead to the cell cycle arrest in the G0 and G1 phase (Ben Sahra, et al., 2008). Metformin’s ability to partially reduce the CIR is clear to be of significance for the prevention of cancer progression and tumour growth, which is based on chronic inflammation. It has now also been shown that the production of the tumour necrosis factor is not only stopped in human monocytes but also in smooth muscle cells, macrophages and endothelial cells (Isoda, et al., 2005). The implication of potentially stopping the cell cycle of a cancerous cell are significant and the fact that metformin has this effect through several pathways highlights the potential of this drug in cancer prevention. Research into the mechanism of metformin arresting the cell cycle has shown that the reduction of cyclin D1 is not enough but that two cycline-dependant-kinase inhibitors, p27Kip1 and p21Cip1, are needed. Their importance is highlighted by their action of preventing cancerous cells from over proliferation and thus they play a key role in cancer prevention (Zhuang, 2008). Metformin’s effect as a drug in cancer prevention significantly depends on its concentration inside cells and the variations found in the membrane transporters, which are responsible for metformin uptake and secretion (Nies, et al., 2009). Organic cation transporters (OCTs) all vary majorly in normal tissue compared to when they are found in tumours; they differ in their expression and activity, which affects their pharmacological and therapeutic actions and outcomes. Two main types of OCTs are found on the basolateral membranes of the liver and kidney whereas OCT3 is found at mRNA level in various different tissues. They all show a high variability due to different polymorphisms, which cause them to show different therapeutic responses to metformin. OCT2 regulates the entry of metformin in cooperation with MATE 1/2, and the secretion into urine, whereas OCT3 is responsible for the transport of metformin. Different polymorphisms exist for MATE 1/2 so these can also be highly variable which again influences the disposition of metformin on its role as a drug in cancer prevention (Riedmaier, et al., 2013). This high variability of the organic cation transporters has some serious implications, as patient exposure and the dosage of metformin administered are affected by the number and type of transporters in normal compared to tumour tissue (Riedmaier, et al., 2013). It makes a patient’s reaction to administered metformin seem unpredictable, due to the different possible variations of OCTs and the following different pharmokinetics expressed by the drug. Studies have however shown that despite polymorphisms in the genes, which code for the OCTs, their possible effects are not significant enough to affect the overall action of metformin, as this drugs acts via multiple ways. Hence it is still able to treat and play a role in the prevention of cancer without causing any known major side effects (Zolk, 2012). In conclusion, the drugs unforseen indirect pharmacological effect on cancer prevention via reducing insulin levels, its currently known action mechanisms, which are AMPK dependent and independent and its variability due to OCTs are the main arguments presented in this article. Their implications and overall significance in a therapeutic and pharmacological context show its high potential in use as a drug for cancer prevention, which however needs to be clinically tested further, but from present studies it has already become clear that the results for these look promising. Please find below feedback on your performance. Note that the structure and content of your essay are given more weight than presentation.